From left to right: Yi Soksan, Nay Vanda and Ny Sokha, with Lim Mony shown in a separate photo on right, at the Supreme Court in Phnom Penh, March 13, 2017. Members of the rights group ADHOC and other civil society groups were refused permission to meet ADHOC officials Ny Sokha, Yi Soksan, Nay Vanda, and Lim Mony, and National Election Committee (NEC) deputy secretary-general Ny Chakrya by the Phnom Penh Municipal Court after gathering at Prey Sar Prison, ADHOC spokesperson Sam Chankea told RFA’s Khmer Service. 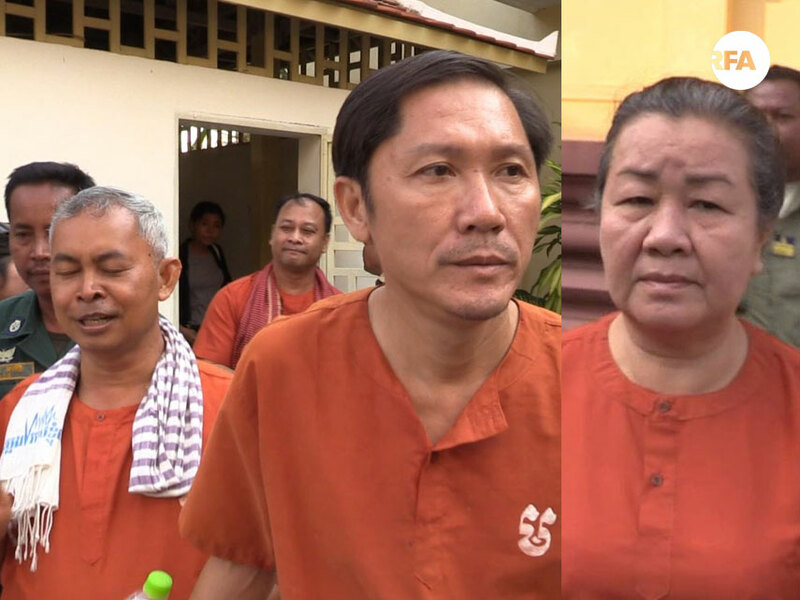 Supporters had been refused permission from the court on several occasions since the five were placed in pre-trial detention nearly one year ago, he said, adding that they had hoped to see them Wednesday ahead of the April 14-16 Khmer New Year. According to Sam Chankea, the court routinely gives supporters “excuses” for not granting them visits, including that its officials are preoccupied with other commitments, but he called the rejections “unreasonable” and said they indicate that the court “harbors ill will” against the five detainees. “What the court is doing shows its persecution and prejudice against human rights activists,” he said. A wide-ranging probe into a purported affair by opposition Cambodia National Rescue Party (CNRP) president Kem Sokha led authorities to charge the ADHOC officials with bribery and the NEC official with accessory to bribery for attempting to keep the CNRP chief’s alleged mistress quiet. On March 24, investigating judge Theam Chanpisith ordered the heads of all correctional centers and prisons in Phnom Penh to refuse anyone other than family members and counsel permission to visit the detainees. No explanation was given for the order. When asked why supporters were barred from visiting the detainees, General Department of Prisons spokesperson San Keo told RFA there was no good reason to do so. “I don’t see any significant concerns that would warrant a ban of such a visit,” he said. However, San Keo said his department was bound by the court’s ruling, regardless of the reasoning behind it. Also on Wednesday, family members of the detainees told RFA they were saddened that the government had refused to show leniency and release the five ahead of the traditional family reunions associated with Khmer New Year. “I wonder how the court and government officials would feel if their innocent loved ones were locked behind bars, even during the New Year celebration, when family members are supposed to reunite and enjoy each other’s company in their own warm homes,” she said. Un Bunnary said that prison authorities allow her very little time to meet with her mother when she visits, and questioned how something so bad could happen to a woman who had done so much good for her community. “My mother is a very good and caring person who does great service for this society—I don’t know how this could happen to her,” she said. On Tuesday, residents of several communities in Cambodia’s southeastern Tboung Khmum province held protests calling for a royal pardon of the five, as well as jailed land rights campaigner Tep Vanny, so they could be reunited with their families during the Khmer New Year. One resident told RFA that if the courts continue to detain innocent people, the impartiality of the judicial system will be questioned and support for the government will be eroded ahead of commune elections set for June 4. Ny Chakrya’s attorney Som Sokong said that his client’s detention had left him in a poor state of mental and physical health, and also affected his family and work with the NEC in the lead up to the local polls. Reported by Thai Tha for RFA’s Khmer Service. Translated by Nareth Muong. Written in English by Joshua Lipes.